I don’t just mean shivery cold- I mean full on icy streets and snow cold. Brrr. In an attempt to get motivated and develop a plan I’ve been scrolling through the internet, trying to find the best outdoor running tips for adverse running conditions. There are a variety of suggestions, everything from ‘wear lots of layers’, ‘get trail shoes’, to ‘modify your shoes’, ‘to stop being a wuss’. Finally I decided that the final strategy for me would be the most valuable. I gave up on my ambitions to return to Park Run this week, as well as officially entering the Virtual Running UK’s competition for this month and instead focused on what my sister called ‘Baby Steps’. 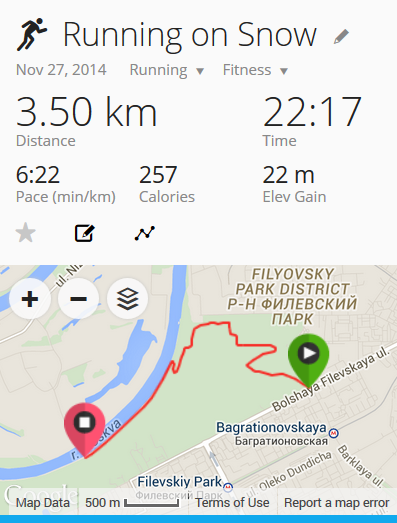 My longest run was thus a lovely, slow (although it felt like a sprint) 3.5km in Filiovski Park. This park is largely empty on weekdays, has awesome outdoor gym facilities to distract me from my run when I’m struggling, features a beautiful contrast of wooded area and river, and the snow seems to have settled here better than in my area. As one might expect, the ‘stop being a wuss’ strategy worked fairly well. The Russians are, as we know and expect, well versed with snow, and have already cleared much of the small layer away. Although this sometimes causes ice formation, most of the paths are made of rough concrete or stones, which means that there is a still a fair amount of traction- and when it gets to precarious you are more than welcome to run off the path. Heading out gave me a great chance to get some more fresh air, to get rid of the deadline stress that is building up again, and to have some me time. I came back somewhat frozen, but exhilarated each time. Baby steps- lets go! My first post as part of the VRUK Blog Hop. Me too!! Can’t decide if i should try to emulate your crazy running goal for November in December, would be like a fitness advent calendar … 100km, you nutter!